Bhubaneswar, Sept. 12: Flautist Srinibas Satapathy strongly believes that flute players are no longer seen as accompanists, but have their own significant identity.The artiste was conferred the Ustad Bismillah Khan Yuva Puraskar for .Born and brought up in Bhubaneswar, 38-year-old Srinivas hails from a family of musicians. 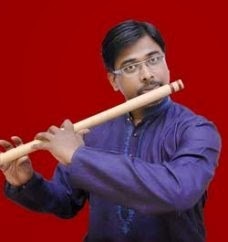 His father Jagannath Satapathy, though a banker, had immense interest in playing and making flutes. Young Srinibas, who used to play tabla, was asked by his father to concentrate on the wind instrument. “I have always believed that he knows the best and that’s why I have immense faith in him. He is not a professional artiste, but the love he has for flutes even at 68 is overwhelming,” said Srinibas about his father. He studied at the department of flute in Utkal Sangeet Mahavidyalaya for seven years completing his graduation and masters and moved to Bangalore where his sister and now noted Odissi dancer Bijayini Satapathy was training at Nrityagram.He stayed in Bangalore for a couple of years and learnt under the tutelage of the legendary Pandit Raghunath Panigrahi.Eager to learn the finer nuances of the art, he moved to New Delhi and got admitted in Gandharva Mahavidyalaya. During his four years of stay, he trained under the likes of Pandit Rajendra Prasanna of Banaras gharana.He became a regular in the Odissi dance orchestras of eminent dancer Madhavi Mudgal. Family ties required Srinibas to return to the Bhubaneswar and he became a guest faculty at his alma mater.“From folk music to films, flute is an indispensable instrument. There is a sea change in the manner the role of a flautist is assessed. He is one of most important of the accompanists,” said the artiste.Srinibas, who has toured all across America and Europe for various concerts, believes that a flautist still needs to dig for opportunities. “Surviving as an independent flute player can be taxing at times. I am delighted with such a prestigious award conferred upon me. It is a dream come true but I have one more plea. Government should suggest the name of the award winning artistes for various festivals as well,” he said.